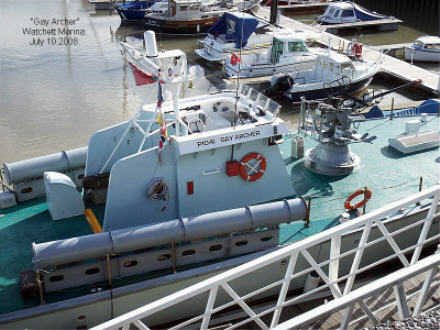 Here are two very recent pictures of the ex-HMS Gay Archer. Looking spotless (as always) being prepared for the trip to the Bristol Regatta. 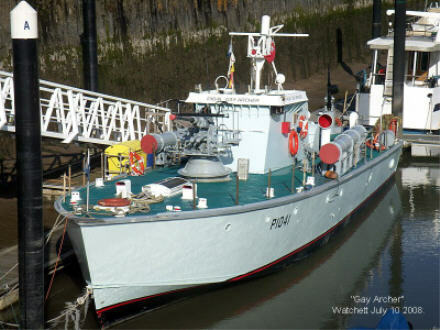 Latest news - not yet confirmed - is that the the ex HMS Gay Archer is not returning to Watchet but staying at a cheaper mooring in Bristol - rumours are that a local Sea Cadet unit is involved. Now this is interesting, just heard from a contact in Bristol that the regatta is on this weekend, did not get a response from post further up so to speak, was just in Bristol with this contact on Wednesday, so don't fancy "popping" up from Kent tomorrow. However, as ever, wish the vessel and owner well, and if going to Bristol and involving my old organisation the SCC, good news indeed, may be going to Bristol a lot soon, so perhaps I can finally catch up with her and see her for myself. GA is back at Watchet (after a successful trip to Bristol). The mooring move is to be later in the year. Nice Daily Mail article, good pics! But I thought Gay Dragoon was in TSTDOS? Only yield when you must, never "give up the ship," but fight on to the last "with a stiff upper lip!" True 'marksaab', Gay Dragoon did have a major part in that film (as P1087) - but - there is a sequence in that film where you can see a good selection of the 2nd Flotilla, 'Archer could be probably one of those other craft. Yes, nice article, but confused, I thought she was diesel powered now? by no means as cheap as it used to be for sure, I know as I work in the marina business, but great stuff, great idea of a south coast trip, along with our other craft, MTB 102, Medusa. An interesting recent video of the ex-Gay Archer has surfaced on the Veteran's web site.